Thirty one people were confirmed dead while seven others were seriously injured when two 18-passenger buses loaded with passengers collided with another vehicle on the Lagos-Ibadan Expressway on Thursday night. The crash occurred close to a construction site around Elebolo area in Oluyole, Ibadan. The Police Public Relations Officer of the Oyo State Command, Adekunle Ajisebutu, who confirmed the incident, said the state Commissioner of Police, Abiodun Odude, had visited the scene of the accident and the survivors at the hospital where they were receiving treatment. The Oyo State Head of Operations, Federal Road Safety Corps, Mr. Cyril Mathew, said the accident occurred at about 8.30pm and blamed it on overspeeding. He said the two vehicles were travelling in opposite directions, adding that the driver of the Ibadan-bound bus had increased speed in an attempt to overtake an articulated vehicle, but he lost control of the bus before ramming into a bus, which was on its way to Lagos. 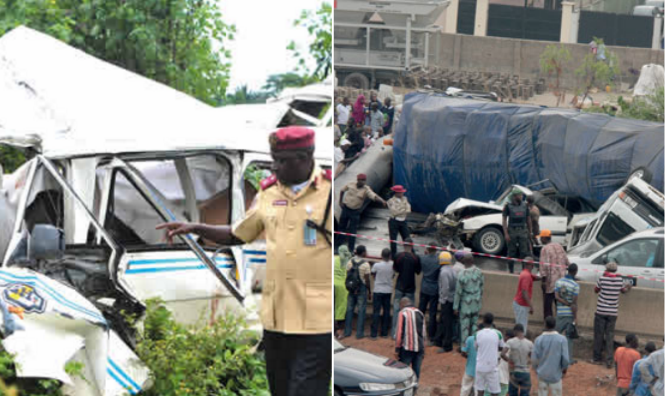 The FRSC boss added that those who survived the crash were taken to the Ibadan Central Hospital, Imalefalafia, while the bodies of those who died in the accident were deposited at the Adeoyo State Hospital, Ring Road, Ibadan. According to him, nine male victims and one female were taken to the hospital and were already responding to treatment. He also said that 20 male adults and 10 female adults died in the accident. One of those who survived the accident, Busari Owolabi, said the driver of the vehicle he was travelling in had been cautioned several times by passengers against overspeeding before the accident occurred. One of the FRSC officials at the scene of the accident noted that the accident could have been caused by the drivers’ use of alcohol. He said that both of them reeked of alcohol during the rescue operation. Meanwhile, the FRSC has cautioned motorists against night journeys following the crash. FRSC Spokesman, Mr. Bisi Kazeem, who confirmed the incident to newsmen in Abuja, explained that the crash involved 40 persons and two Mazda buses.